Ever wanted to see the Microsoft man in his vest? 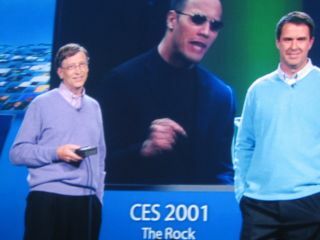 CES provided the perfect backdrop for a couple of genuine Weird Tech gems this week, kicking off with Bill Gates' spoof 'Last day at the office' video from his keynote speech. He's no Steve Jobs, it's true, but there are a couple of definite You've Been Framed-esque moments lurking around in there. And it's good to see the Microsoft man having a laugh at his own expense (if perhaps less so to see him in his vest). If you've ever desired to see an underwear-clad Gates astride a giant, bouncing exercise ball, check out the video. In terms of CES however, pick of the week is most definitely the MP3-playing Taser. Brought into the world by Taser International, the lightweight music-playing device is also a full-blown law enforcement strength taser with an LED flashlight and laser for added accuracy. Plus it comes in your choice of leopard print ($370), brilliant pink ($350) and bright blue (same). We don't condone violence here at TechRadar but stick on a mobile phone (why not, everyone else is) and we think they're on to a winner. Perfect for the 4am walk home after a night on the tiles. Speaking of violence, there's been a lot of games console-induced anger this week by the looks of it. An impatient - and clearly troubled - American teenager attacked his father after being prevented from downloading songs onto his iPod. The boy was allegedly so enraged that he bit off a chunk of the man's finger and kicked him in the groin. On hearing the ruckus, the mother entered the fray and helpfully punched her husband in the face. The woman was arrested on charges of fourth-degree assault, police said. Meanwhile, an 18-year-old was arrested after trying to kill his father by strangling him with the cable of his (as yet undisclosed) videogame console gamepad. And we heard highly sketchy reports of a man shooting his son over an Xbox argument. In lighter news, did you know that the Queen loves her Wii? Apparently Her Royal Majesty is showing "all the signs of becoming a Nintendo addict," The People newspaper reported. Six-foot swells are set to break on the Thames if the £20m Venture Xtreme project goes ahead as planned. The world's first outdoor artificial surfing machine is set to bring perfect conditions to a disused dock in east London. Planners (and locals) are hoping it'll persuade the 60,000-odd weekend warriors to abandon the Friday evening pilgrimage down to Devon and Cornwall in favour of a quick trip to the Thames. What, no grockles? We'll believe it when we see it. With Macworld fast approaching, have you picked up your keynote bingo card yet? If not, get yourself over to Ars Technica where John Siracusa has posted his definitive Macworld Keynote Bingo card in its traditional PDF format. Including all the usual Jobs-ian catchphrases - yep, it's got "Boom" - make sure you familiarise yourself fully with the rules before playing. Shouting "Bingo!" when you haven't actually won is never cool, particularly during a keynote speech.